Vietnam’s Ministry of Agriculture and Rural Development, in technical partnership with the Saola Working Group, has selected Vietnam’s Bach Ma National Park as the site for the world’s first saola breeding center. The Bach Ma center is currently under development, with completion targeted for late 2017 or early 2018. Before bringing animals into the center, however, the team will need to find them. Since the species’ astounding discovery in 1992, only about 10 saola have ever been captured alive, all caught by local villagers in Laos and Vietnam. Without professional veterinary and husbandry care, the longest that any of the animals lived was a few months. 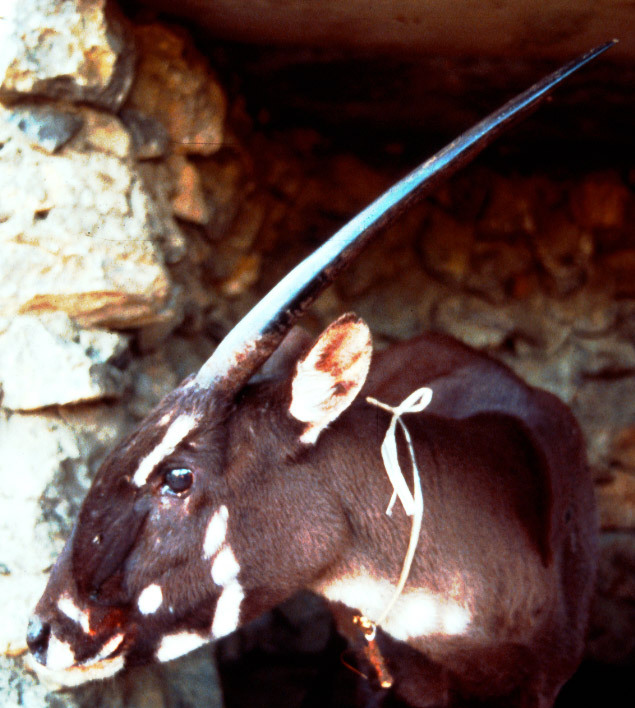 The last saola known to be captured alive was in 2010 in a village in Laos. It died in less than a week. Biologists have also only photographed the species five times in the wild since its discovery, all by camera traps—twice in Laos and three times in Vietnam. 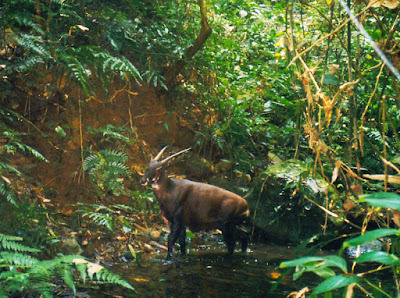 The most recent camera trap photos were taken in 2013, when a WWF camera trap caught images of an animal in a saola nature reserve in central Vietnam. It was the first photo of a saola in the wild in more than 15 years. Saola are difficult to detect because of their elusiveness, which gives them the nickname Asian “unicorn,” and because they live in dense forest in remote and difficult terrain. SWG biologists and partners are currently testing several techniques to detect saola, ranging from “tried-and-true” methods, such as the use of automated camera traps, to newer methods including environmental DNA. Camera trap efforts in the saola’s range have provided invaluable information about other rare and endemic Annamite species in recent years, including the Annamite-striped rabbit and the critically endangered large-antlered muntjac, which is a species of barking deer. Large and medium-sized mammals in the Annamites are threatened by intensive poaching, usually accomplished by the setting of wire snares. SWG and partners will also use the breeding center to establish the first conservation program for the large-antlered muntjac, which was discovered two years after the saola. This will be the first organized attempt to breed either species.